Cost of energy is rising in India. LPG and electricity are already very expensive and gradual reduction in subsidies will continue to add stress on household budget. With new rules that reduce the number of subsidized LPG cylinders per household, the cost of cooking has also gone up. In a previous post on Induction Cookers (link) we talked about comparison of gas versus electricity. 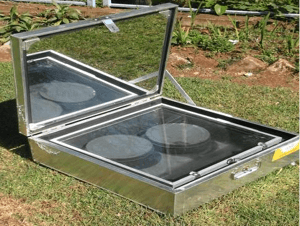 But if you are really interested in avoiding rising costs, going green and avoiding all the other methods, Solar Cooker/Oven can provide a good alternative (although with certain limitations). 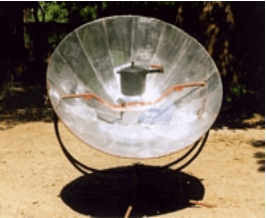 Solar cooker or oven is a device that uses direct sunlight to cook or heat food. It does not use any fuel and thus is very cheap to operate. It uses a reflective surface such as glass or metallic sheet to concentrate light or heat from sun on to a small cooking area or utensil. The utensil has to be painted with dark non-reflective paints so that it absorbs heat from the sunlight, thus cause the contents of the utensil to heat up and get cooked. In India most places get 275 days of sunlight with a high level of solar radiation. Solar cookers can be used from one hour after sunrise to one hour before sunset on most clear days. Thus any use of solar energy makes a lot of sense. Drivers such as fuel shortage, health impact of burning biomass and climate change makes a strong case of using solar cookers especially in rural areas. These are typical solar cookers that are used in smaller households (4-5 members). It has a box with transparent glass or plastic top and reflectors to concentrate sunlight in the box. The box is painted dark and the utensils are kept inside the box. It is better to use containers that are painted dark for better cooking. The temperature in the box does not go beyond 150 oC and thus it takes time to cook food. The food has to be left in the box for longer duration to cook well. Also based on the direction of the sunlight position of the box has to be adjusted every 15-20 minutes. This type of cooker costs about Rs 1500 – Rs 2000. This cooker has a parabolic dish that concentrates sunlight on to a focal point where a vessel can be kept. A typical black colored cooker can be kept at the focal point to cook food. This kind of solar cookers can achieve up to 350-400 oC thus cooking food much faster. It can be used for roasting, frying and boiling. Because of its size, it is good for cooking food for 10-15 people (some small ones are also available in market that are good for 4 people). This kind of cooker also needs adjustment based on the direction of sunlight. There are different types of models available in market that either need manual adjustment or can have automated adjustment mechanism (mechanical clockwork arrangement to track sunlight). 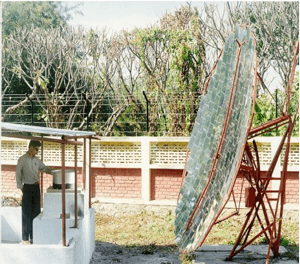 The cost of a dish solar cooker is about Rs 6000 – Rs 7000 and it can save up to 10 cylinders per year (based on the use and sunlight). This cooker can be easily dismantled and assembled by anyone thus providing ease of movement and can be transported anywhere easily. It is also user friendly as the height can be adjusted based on the person using it. Bigger size dish cookers are also available in the market that can cook food for about 40 people and costs about Rs 30,000 (saving around 30 LPG cylinders). This kind of cooker is closest to a conventional cooking system. It provides possibility of cooking inside the kitchen. It has large reflectors standing outside the kitchen and a secondary reflector that concentrates the sunrays at the bottom of pot or frying pan painted in black. The temperature that can be attained is so high that it can cook food much quicker than a box cooker. It can also be used to make chapatis, dosas, etc as it acts much like a conventional system. The person using the same can remain in the kitchen while doing the cooking. Because of the size, it is good for cooking food for 40-100 people. It costs anywhere between Rs 75,000 and Rs 1.6 lakh depending on the size and saves up to 30-65 LPG cylinders in a year. Most of these systems are equipped with automated rotation system to track sunlight. They have a mechanical device or clockwork arrangement that rotates the reflector to track the sun.